Front left – Wayne Sparks, Lucian Dixon, George Bostic, Richard Dunbar, Lewis McCormick, Jim Allen, Huddy Neal, Bob Bostic. Back row – Tom Patton, Jim Erskine, Albert McClung, Jerry Reed, Eddie Judy, Roger Compton, Kyle Baker, Bob McNeil, Bob Allen. 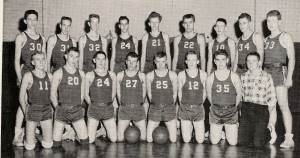 Leonard Houchins became the Coach at Union High School in the fall of 1957. His daughter Judy was a senior at Greenville High School and decided to stay at Greenville as she was a cheerleader for their basketball team. 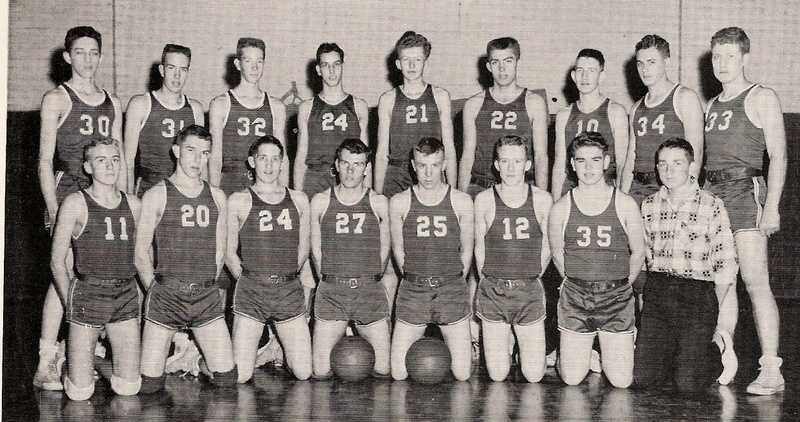 In February, 1958, Greenville, coached by Leonard’s brother, Rufus, came to Union undefeated 17-0. Leonard developed a play whereby Union got the ball down the left side of the court and I was supposed to get a quick shot off. Towards the end of the 4th quarter, Union had a slim lead, Greenville scored, the play was run and the shot I took was wild and over the backboard. Coach Houchins called a quick time out and asked me what happened. I replied that someone had kicked me. He was extremely irritated at my answer. Union won the game, but Coach Houchins was not through with me. He kept me after the game, lights out, gym cleaned, before he let me go home. The next morning, I entered school and spotted Coach Houchins down the hallway. He spotted me about the same time and waved for me to come to him, he had a big grin on his face which made me think he was still mad at me. However, when I approach Coach Houchins, he said I owe you an apology. I said, “ you do?”. He said I went home last night and told my family about the preposterous story you told after the wild shot. This morning, Judy sheepishly sat down at the breakfast table and admitted she was the one who kicked me. Remembering the old gym had the brick wall with about 2 feet for the cheerleaders to stand, placed Judy in the exact position needed to kick me as she was cheering for a play Greenville had just made. Since that day I have tried to find someone, fan or teammate, who saw what happened, but no one seems to know except Judy and I. If you remember anything about this story, send your comments and we will print them here.